The sous vide setup mk 1 is good for gettng started, but it's limited in the amount of food you can cook in it. A larger-volume sous vide cooker is easy to make but a bit more involved. The cooker unit contains heating elements, a thermocouple, the temperature controller, and an aquarium pump (to mix the water). The whole lot is in a single box, ready to be placed on the edge of any convenient water bath. Make magazine has a good description of how to make such a cooker. However, not all of the parts are easily available in the UK, so some modification was needed. Here, I give some hints and tips on how I made my cooker. You'll need to read the original project description for these variations to make sense. Heaters: The main problem I had was getting the immersion heaters. There are plenty of 110V in-cup immersion heaters available on eBay, but very few 240V ones that look capable of reaching the required temperatures. I ended up getting some Russian ones from an eBay seller in Ukraine. The plus side is that they're 500W heaters rather than the 300W ones in the original article. That makes the cooker capable of heating quite large water volumes (30l - 40l). The down side is that they're quite a lot larger than the baseline version, so that makes the whole unit much bigger. Enclosure: Make sure you get one that's big enough to hold the controller and the heaters. I ended up getting a monster box with dimensions 21cm × 13cm × 9cm. It needs to be that big to fit the 16cm required of the three heaters and pump in a line. Controller: I reused the TET 612 from the Sous vide setup mk 1. Temperature sensor: Again, I reused the type J thermocouple from the Sous vide setup mk 1 rather than the PT100 platinum temperature-dependent resistor from Make. All the pumps require an additional power supply. Glue: Hot glue gets used a lot in this project, but not all hot glues are made equal. Most hot glues melt at around 105⁰C which means that, at the temperatures reached while cooking, the glue has softened considerably and everything falls apart. This is both disappointing and the cause of many sarcastic comments from spouses. But all is not lost! You can get high-temperature glue that melts at 165⁰C, which remains stable at sous vide temperatures. High-temperature (and dual-temperature) glue guns are quite common, but the glue is rarer. Make sure you also get glue that only melts at the higher temperature: dual-temperature-compatible glue will still melt at the lower temperature, so won't do. Perspex/acrylic sheets: These are very large and expensive. You can probably get a deal from your local DIY shop on a damaged sheet as you'll only need a tiny amount. Sealant: This also gets used a lot in this project. Make sure you use bathroom/kitchen sealant (the kind that smells of vinegar as it cures) rather than the cheaper generic sealant. The generic stuff falls apart when held over hot water for several hours. Switch: I didn't bother with an additional power switch in the cooker. I just use the wall socket switch to control it. Don't make the holes for the heaters too near the sides of the box: I couldn't make the holes sufficiently accurate for the heaters to stay in by friction alone, so I had to use hot glue to hold them in place. If you do that, remember to leave sufficient space to get a glue gun round all sides of the heater inside the box. Perspex softens quite nicely over a gas ring: You won't need to sacrifice a pan to protect the perspex, so long as you're careful and don't hold the perspex too close to the flame. Perspex clamps are for small boxes The combination of larger box, heavier heaters, and the thinner perspex I was able to obtain conspired to make me reject the C-clamp style of attachment for the cooker as described in Make. As I'll only be using the same pot all the time, it was easier to cut a hole in the water-bath lid and place the cooker over that. The lid supports the box while the heaters, etc. dangle in the water. Sandpaper surfaces, especially perspex, before gluing: Perspex is very smooth and glue can't key into the surface. A bit of sandpapering means that things don't fall apart instantly. Glue down the relay: The SSR is quite large and heavy. Once you're sure everything's working, fix the relay in place with a small dab of hot glue to stop it rattling around when the box is moved. Secure the controller: Because the controller sits in a slot cut in the side of the box, with the lid on top, the controller is only held on three sides. This means it can tilt slightly, a purely cosmetic concern. To fix it, put a large blob of hot glue on the inside of the lid to press against the controller (you may need more than one layer). Make the blob slightly higher than you need. 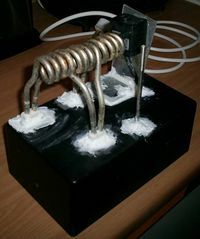 Place two layers of tinfoil over the glue blob and rub over them the clean tip of the glue gun (without applying glue) until the glue blob is flat and the correct height. Remove the top layer of foil and you will ensure that no glue touches the controller, making it easy to remove the lid if needed. The wiring mostly follows from that in Make. A solid-state relay (SSR) controls power to the heaters. The SSR is controlled by the TET-612 controller with input from the thermocouple. The pump is permanently on while power is supplied to the unit. The connections between the parts are made via screw-down connector blocks. After making all the connections, cover all the terminals with insulation tape to prevent accidental short circuits. Make sure all wires and connectors can take the load: the heaters will draw 1500W at 240VAC, so the unit as a whole could draw over 7A. Not shown on the wiring diagram is an earth connection from the mains to the pump. The heaters have no earth connections. You will need to set the 'SouF' and 'ot' parameters before doing the tuning. The controller will move the water temperature above and below the target three times, so it could take up to an hour to do. The C-clamp style attachment is a more convenient way of securing the heater, as well as allowing it to be used on different pots. But, as I said above, I'w wary of using perpex to hold the cooker stable, as its large, heavy, and perspex weakens in higher temperatures. I'm investigating using a piece of aluminium as a clamp instead. Don't turn on the cooker unless the heaters are immersed in water above their 'shoulders'. They'll burn out in a very few seconds otherwise. Don't run the cooker above 75⁰C. I once tried cooking carrots at 85⁰C and melted the pump and the perspex pump support. The pump never worked again. 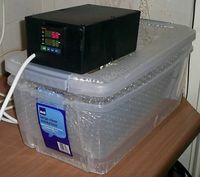 Tom Ordway's sous vide cooker. This page was last edited on 25 September 2011, at 10:42.